Therm Dynamics Patented Flameless Heaters are the standard for safe heating for oil rigs, fracturing operations, pipeline repair…anywhere safety is a must. 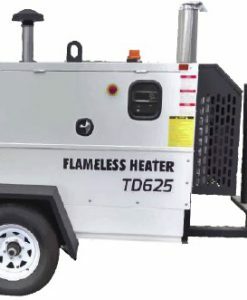 Therm Dynamics flameless, sparkless diesel oil rig heaters made by JR Koop are the safest heat available for volatile situations. No OSHA type setbacks are required as there are no open flames nor sparks. No generator or other electrical power is necessary. 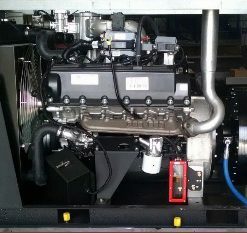 A diesel engine is enclosed in an insulated chamber; the engine torque is converted to heat and combined with the captured heat of the engine. High volume airflow is acheived by thermostatically controlled fans. The Therm Dynamics flameless heater is the original patented flameless heat source that has become the standard specification for safety. Therm Dynamics flameless heaters are CSA and UL certified and meet OSHA, MSHA and API safety standards. 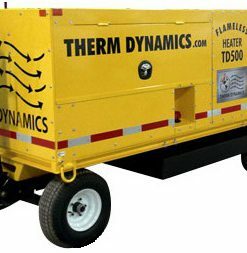 Therm Dynamics developed and patented the process of converting and capturing the torque of a diesel engine into heat, and combining it with all the other sources of heat – from the heads, exhaust, cooling system – to make a totally flameless and sparkless heater; it provides its own high volume airflow without any electric fans or any other ignition sources. These are the safest heaters for volatile environments. Totally self contained, these patent-protected oil rig heaters are also popular for other applications requiring heated air and high air flows. These units are also applicable for fire restoration, thermal remediation, pest control and any application where self-powered heat is needed. Very popular on the oilfields, Equipmentland is one of the original dealers and has developed units for the largest applications, drying offshore oil rig stator windings and more. Flameless heaters are now being specified by oil companies. Units run 24-7, and only need periodic maintenance, mostly fluid replacement. High BTU output and high airflow (CFM) get the job done. Warranties provided by the engine manufacturers and Therm Dynamics (JR Koop). Equipmentland provides great prices and custom units for US, Canada and export, including double containment, oversize tanks, custom colors, graphics, etc. 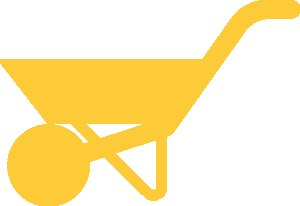 Contact Equipmentland if you want to be included on our list of people to be contacted when units become available, specials, and pricing and model updates. 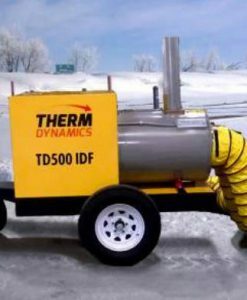 Therm Dynamics’ patented technology uses diesel power to agitate hydraulic oil in a flameless, sparkless, low-pressure environment to deliver high BTU output and remarkable air flow up to 9,000 CFM. 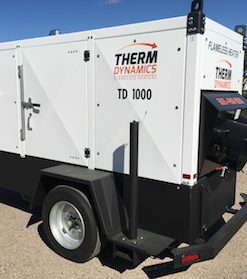 In brief, the Therm Dynamics system converts the engine torque into heat and dissipates it inside an insulated cabinet which also captures the heat produced by the engine heads, cooling system and exhaust. The unit is a specialized heat producing unit which is safer and more trouble free than anything else on the market. The diesel engine powers both the patented unit and an additional high CFM fan to provided a robust flow of heated air. Heat output is controlled by simple RPM settings on the diesel engine throttle. 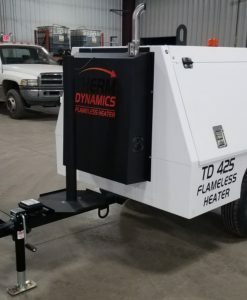 Therm Dynamics flameless heaters are more fuel efficient than indirect-fired heaters, as the heat lost in the exhast stack of an indirect-fired heater is captured by the Therm Dynamics unit. Fuel economy can be achieved by simply throttling down the RPMs. All controls and auto shutdown systems are provided ensuring safe operation and equipment protection. 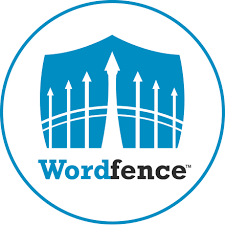 Safety setback requirements have lessened from typical 70 – 100 ft. to zero for volatile applications. 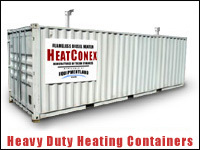 Clean heated air can be delivered directly from the unit’s discharge or through attachable flex ducting. A new additional fan provides static pressure higher than ever before. The heat generator and engine are enclosed in a locked cabinet complete with automatic shutdown features, floor, and removable doors. Trailer units are mounted on 5,300 lb. torsion-bar axle/s with 15″ wheels and tires. These rig heaters are designed for stand alone, 24-hour trouble free operation. Given the flameless and sparkless nature of the technology, the unit is ideal for oil and natural gas wellheads, fuel farms, mines, airports and anywhere fire is of concern. Units are available in skid or trailer mount, 200 to 400 gallon tanks, single and tandem axles. Standard Equipment on most models (dedutible when needed) are the Intake Air Auto Shutdown Valve (resets itself at complete shutdown), Sparkless Alternator, Thermostatically controlled automatic intake louvers, Emergency Shutoff Switch, and Master Lock-Out. Additional accessoriese include Duct Storage Bins, Amber Strobe Light, Recirculation Inlet Kit, Sky Hook, and Insulated and Uninsultated Ducts or hoses. 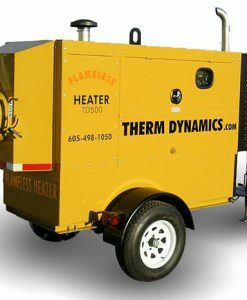 Equipmentland is the original and primary online provider of flameless heaters by Therm Dynamics. 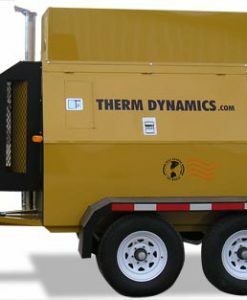 Equipmentland is instrumental in the development of the largest output and custom models and fleet pricing for Therm Dynamics. 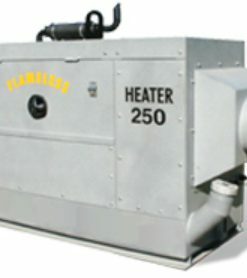 Equipmentland is not in the rental business, we provide heaters to rental companies, oil service companies, oil companies and other cutomers for other applications such as water restoration, pest control, aircraft heating, mold abatement, ground thawing and more. – NOTE: Fall orders usually require ordering in advance with small deposit. – Some models may be in stock. Inquire today. – Used units someimes available. Inquire for list of available low-hour units. – Equipmentland sells to end users and oil industry service rental industry. For Therm Dynamics Flameless Heaters: General Information or Warranty. For information about Therm Dynamics heaters for Ground Thawing. 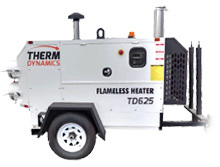 Equipmentland is an authorized dealer for Therm Dynamics Flameless Heaters. We ship to any US state, Canada, and world-wide export. 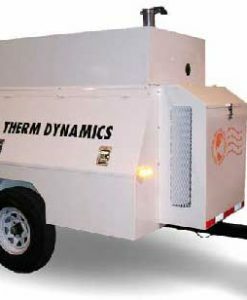 Equipmentland is the primary Therm Dynamics dealer. Contact Jeff Dayne at Equipmentland today for more information. 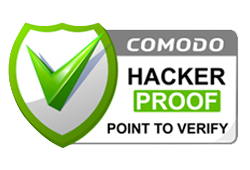 Call 1-800-214-1649 or use our handy contact us form. – PVC with helical coils. – John Deere 4045 Tier IV (DEF) Diesel Engine 134 HP. – Fork pockets and lifting eyes. Can be air lifted. NO MORE Therm Dynamics Model TD1200. Even from the manufacturer. TD1200 has now been replaced with TD1000 (Tier 4-DEF).